Download the included M2P Instructions here in .pdf form. 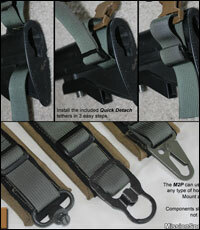 See how easy it is to add your own hooks to the M2P. See a more in depth view of the M2P with this video. 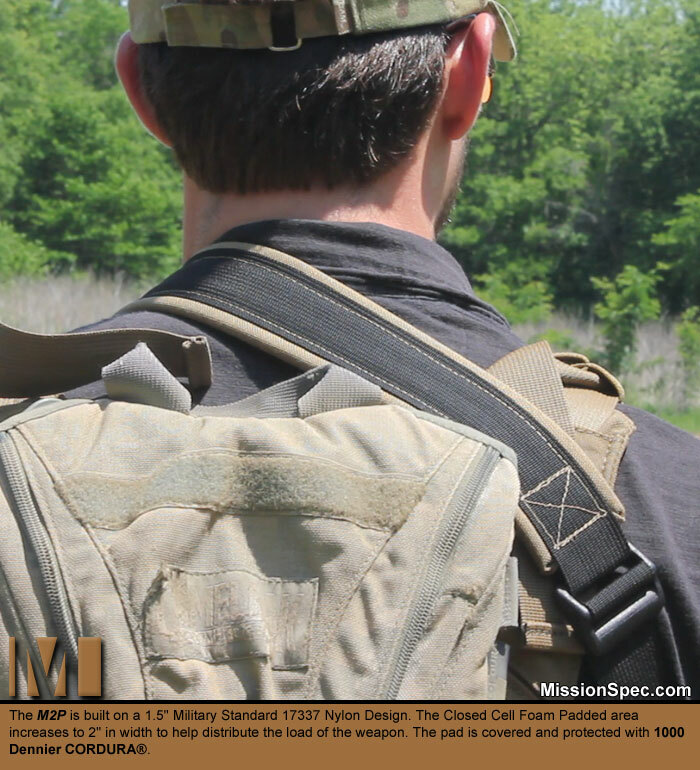 The M2P is primarily a Two-Point adaptive sling with multiple carry positions which greatly increases the usability of the M2P. 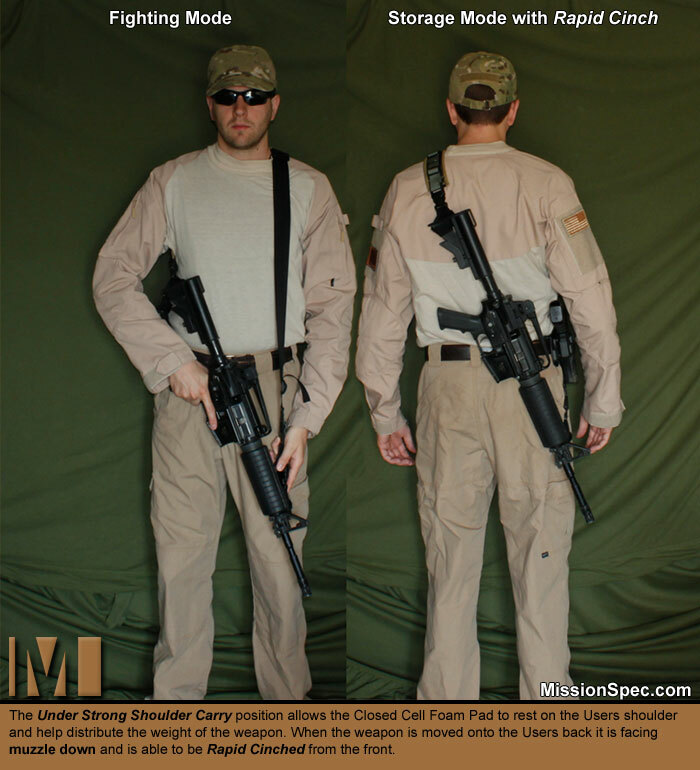 By placing your Strong Side Arm through the sling this carry position allows the Closed Cell Foam Pad to rest on the Users shoulder and help distribute the weight of the weapon. 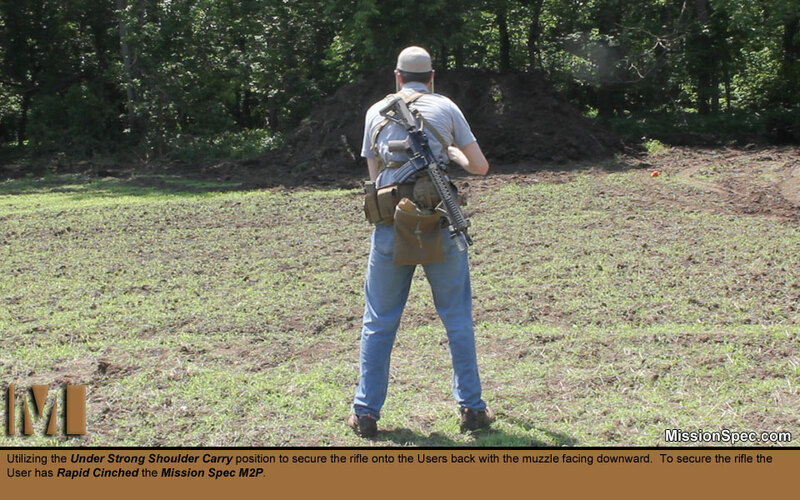 When the weapon is moved onto the Users back it is facing muzzle down and is able to be Rapid Cinched from the front, securing the weapon (as tightly as desired) to his/her back. 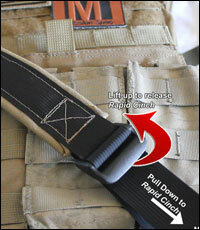 Release Rapid Cinch by pulling upward on the Tension Lock [picture]. 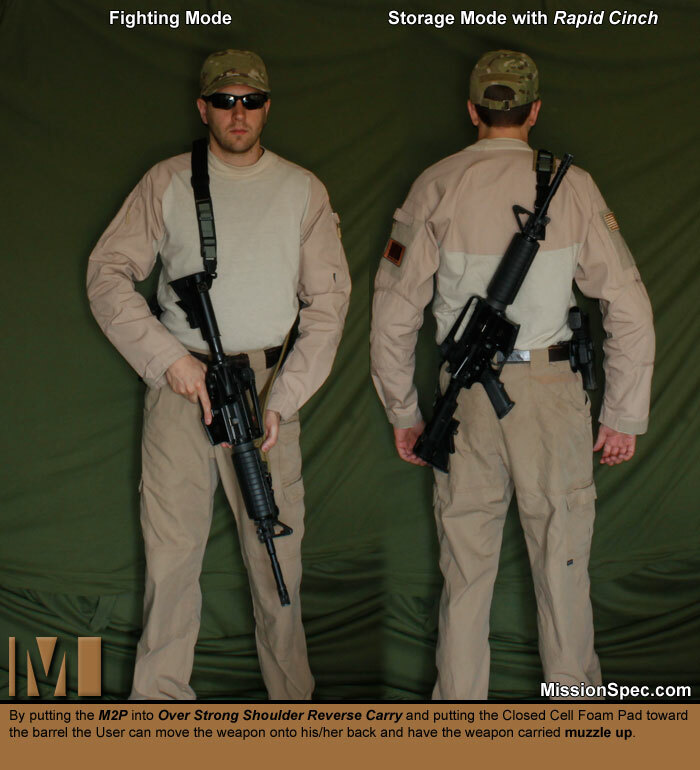 Under Strong Shoulder Carry is the most common carry style for the M2P. 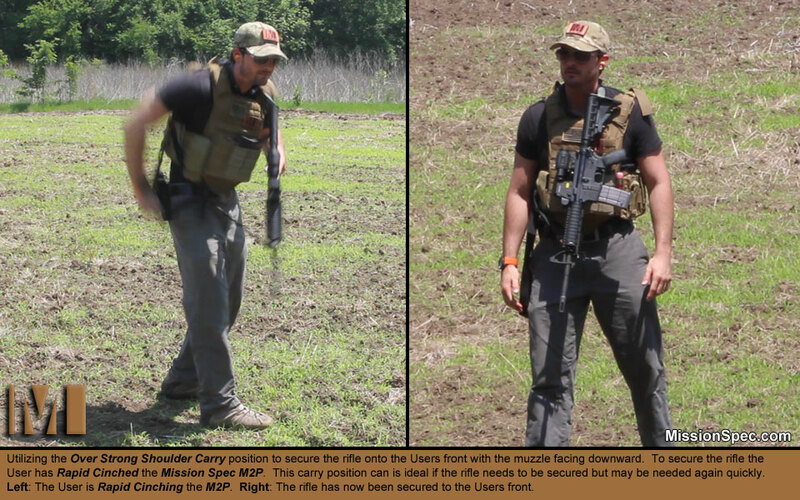 By reversing the M2P and putting the Closed Cell Foam Pad toward the barrel the User can move the weapon onto his/her back to have the weapon carried muzzle up. 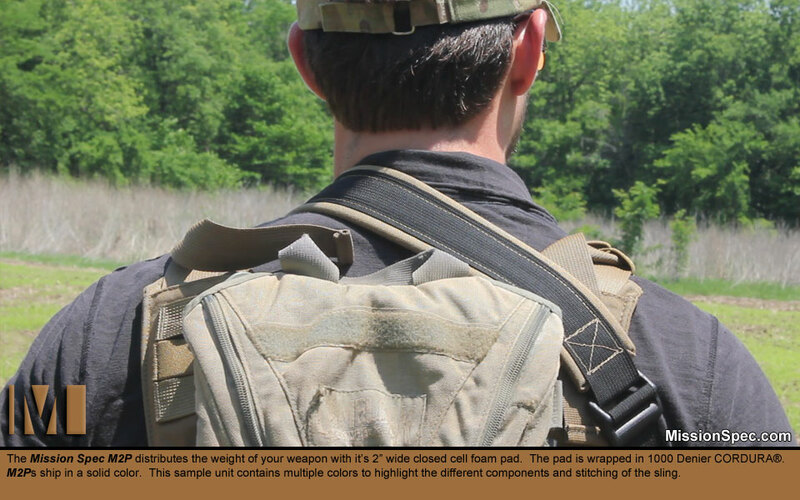 Rapid Cinch is accomplished with the same motion as Under Strong Shoulder Carry (by pulling down on the Rapid Cinch Strap which will be located on the Users front when the weapon is to the rear. 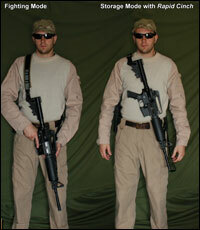 Release Rapid Cinch with the same method as above [picture]. 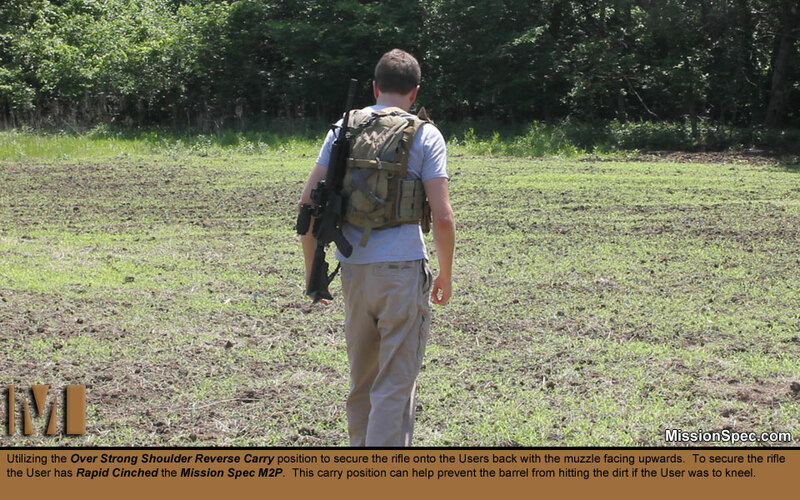 Over Strong Shoulder Reverse Carry is preferred if the User will be kneeling and would like to keep the weapon barrel out of the dirt. During helicopter borne operations the muzzle should never be stored upwards as most critical components to the aircraft are located in that direction. 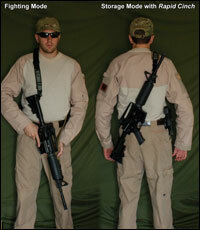 This carry style will allow the weapon to be Rapid Cinched to the front of the User. 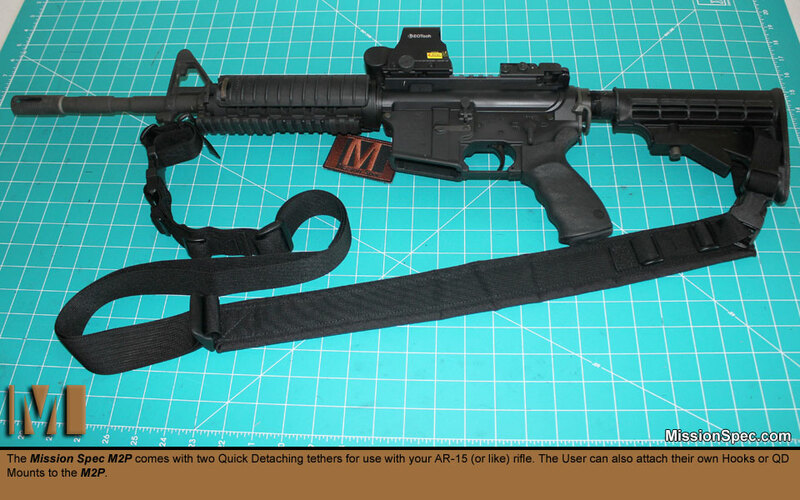 When the weapon is needed it can be easily released with the Tension Lock [picture]. 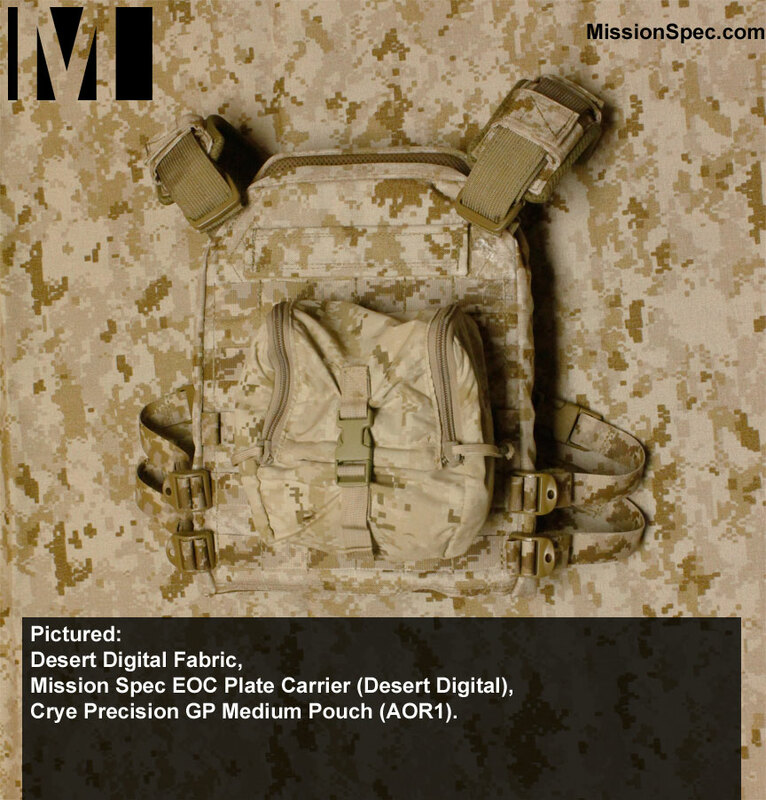 If there is no time the User can simply activate one of the two Quick Detach buckles on either end of the Mission Spec M2P [included Quick Detach Tethers]. 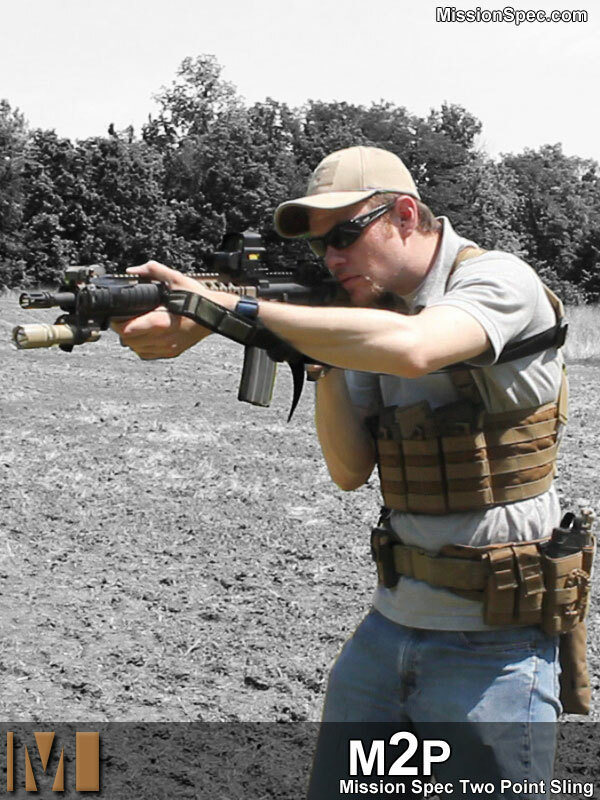 This carry style works great for fast roping or other situations where the rifle will be needed quickly. 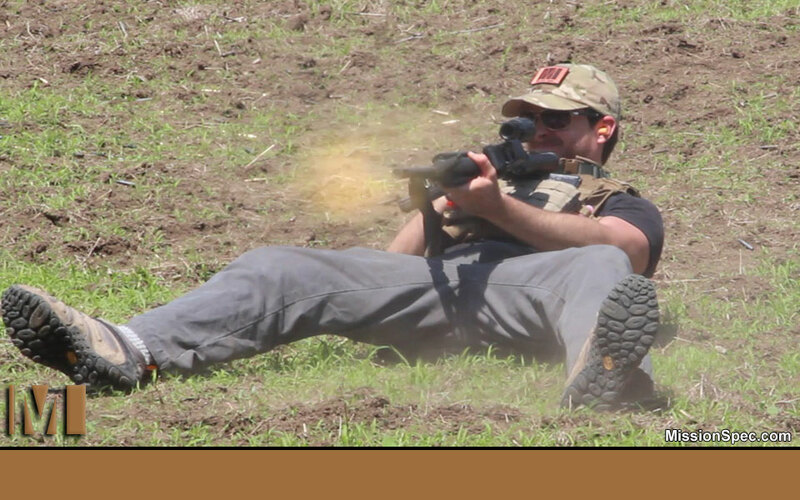 Rapid Cinch allows the User to secure the weapon as tightly as necessary to his/her body in order to accomplish other tasks (rendering aid, climbing, going hands on, etc). 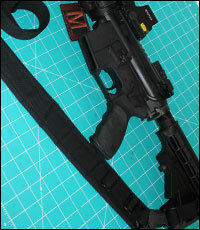 Rapid Cinch is NOT a form of quick adjustment rather an uncomplicated procedure for securing your rifle. 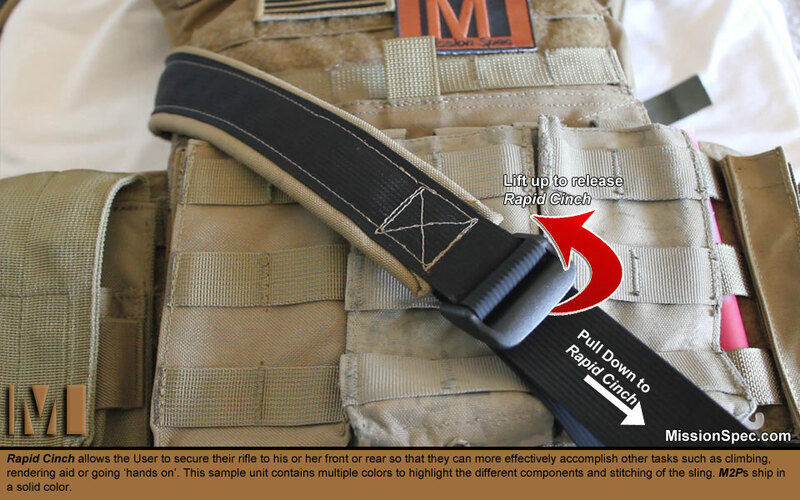 Releasing from Rapid Cinch is as easy as lifting on the Tension Lock device which will return the sling to the exact length it had been previously set. 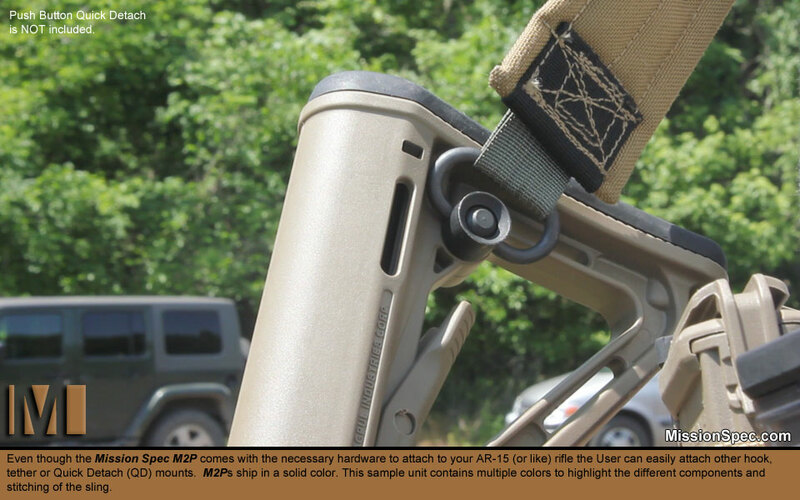 The M2P will easily attach to your AR-15 (or like) rifle with the included mounting hardware in three easy steps. 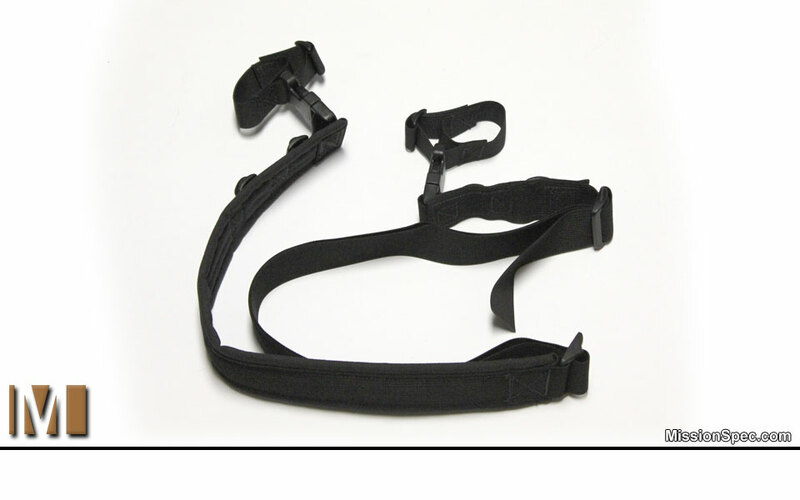 Both included tethers are able to be Quick Detached should the User need to completely extricate themselves from the sling and weapon in an emergency. 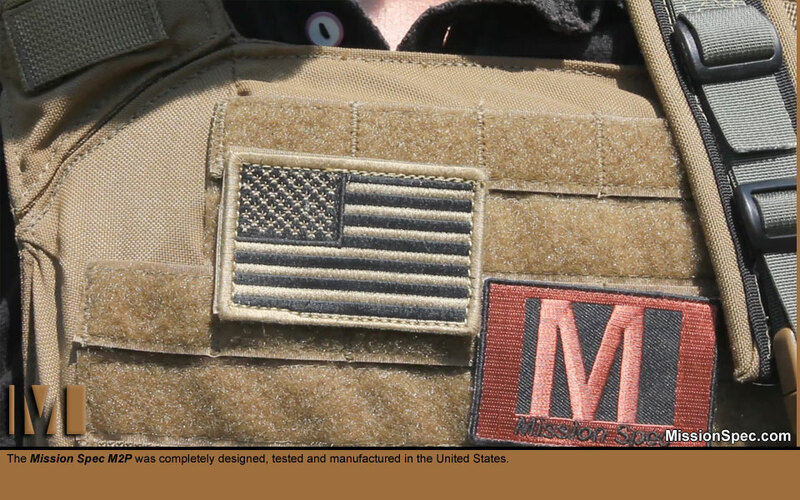 The User also has the option to add almost any other type of hook or tethering system to the M2P (MASH hook, HK style, Push Button Quick Release, etc). 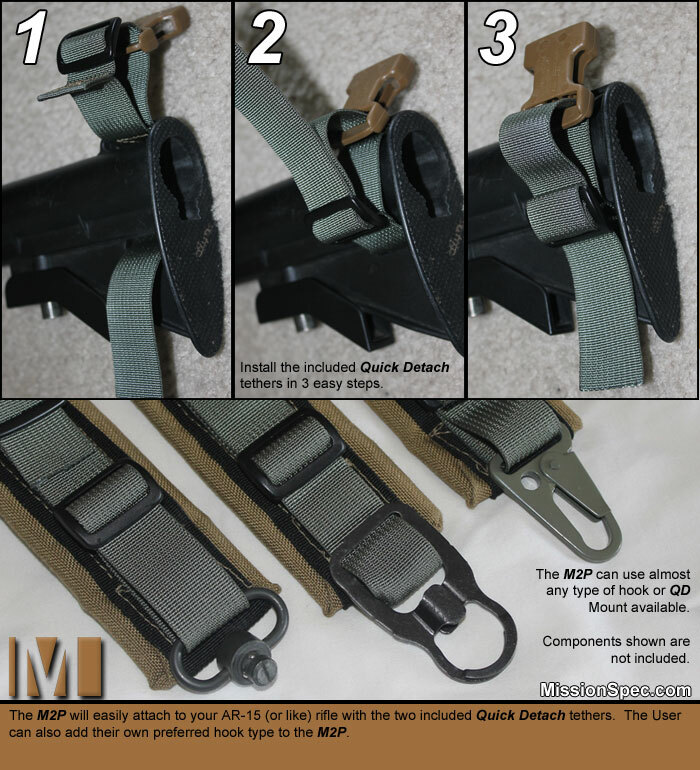 At any time the M2P can be Quick Detached from the Users body by activating either of the two Heavy Duty Side Squeeze Buckles located at either end of the sling. 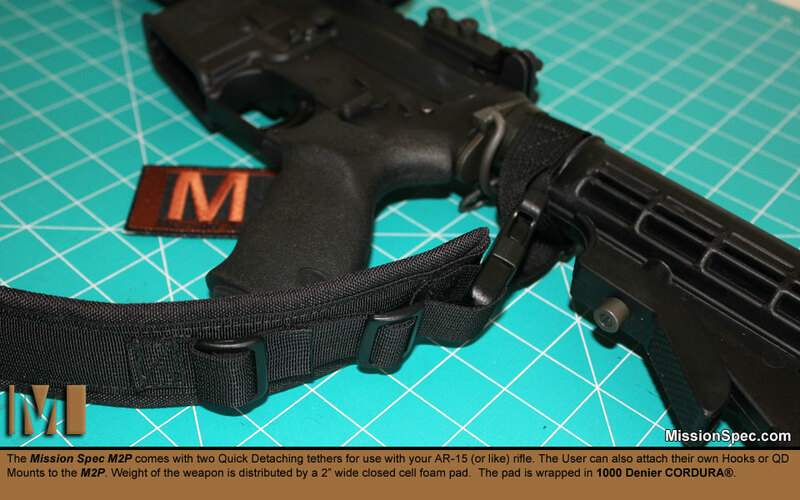 If the rifle is Rapid Cinched to the Users front then both QD buckles should be accessible. 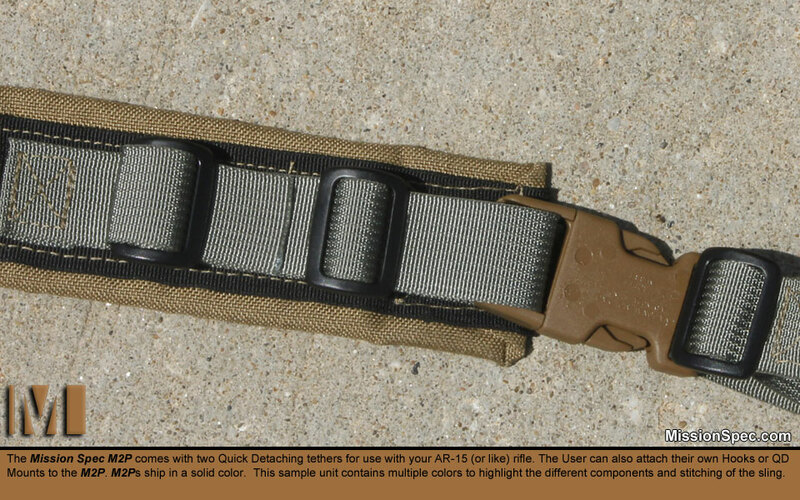 If the rifle is Rapid Cinched to the Users back then the lower QD buckle will be the most accessible. The M2Ps simple design allows for an almost zero learning curve experience. 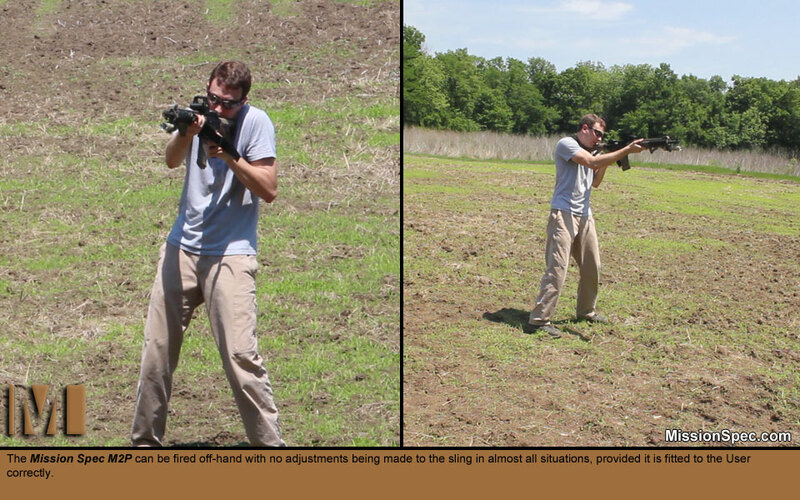 Once attached to your weapon and with minimal repetitive practice you and the sling will come up to speed in no time. 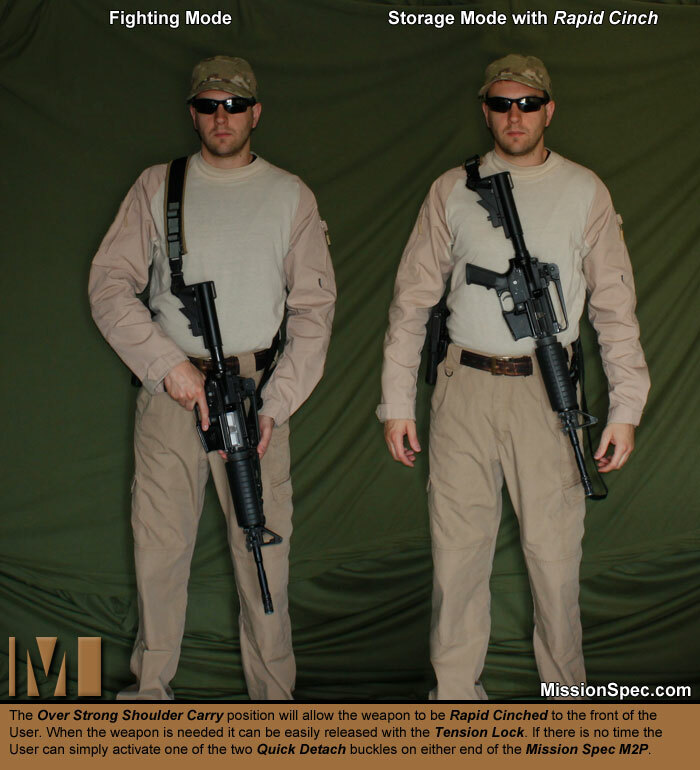 Extensive testing was conducted on M4 length rifles. The M2P should have no problem connecting to any rifle that is M4 length or larger. The maximum adjusted size between the two tether points on the M2P is approximately 75 inches. 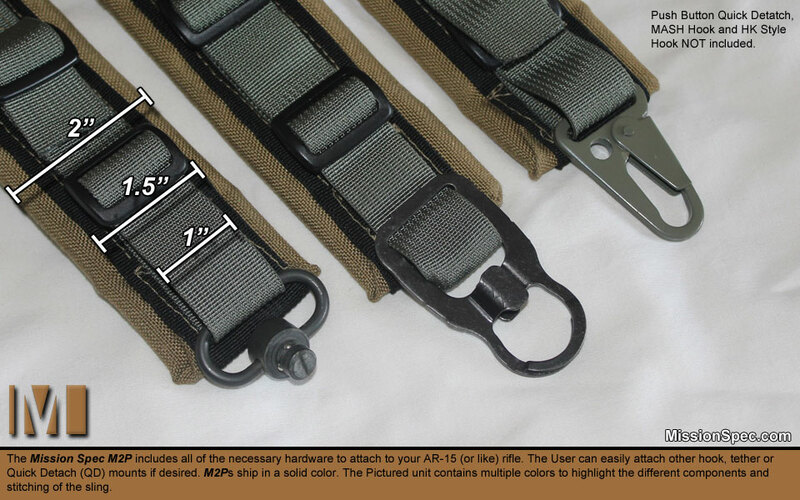 Your M2P will arrive at an adjust length of approximately 54 inches. 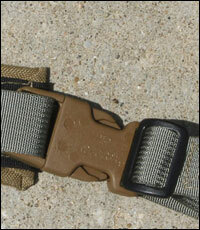 The M2P can always be shortened, removing and excess webbing if the User prefers. 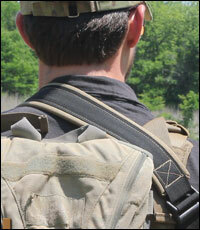 The entire sling is built on a 1.5″ Military Standard 17337 Nylon Design. 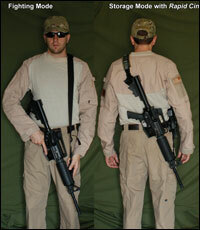 The Closed Cell Foam Padded area increases to 2″ in width to help distribute the load of the weapon. The Closed Cell Foam Pad is covered and protected with 1000 Dennier CORDURA®. 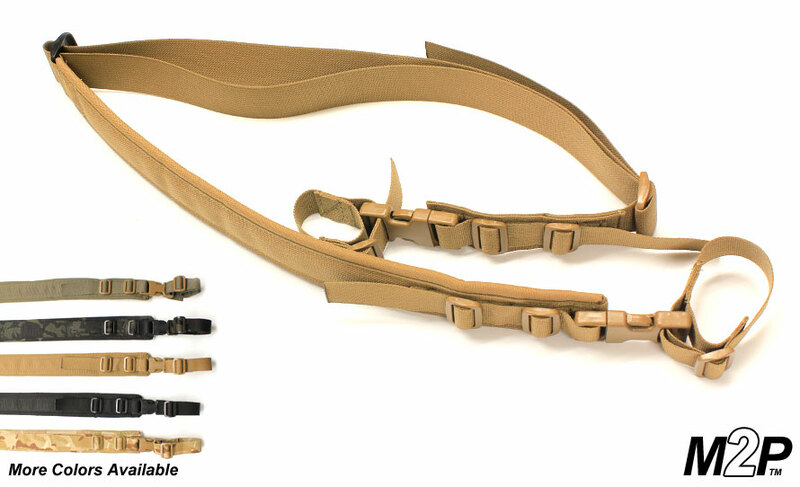 The entire sling is built to be Berry Compliant (see: Berry Amendment USC, Title 10, Section 2533a). Don’t see the pattern or color that you need? Let us know. We like a challenge.